Prime Bank Limited has recently signed a remittance distribution agreement with UDDIPAN, a Micro Finance Institution (MFI), in the form of Strategic Alliance for Remittance Services. Md. Ehsan Khasru, Managing Director of Prime Bank and Md. Emranul Huq Chowdhury, Executive Director & CEO of UDDIPAN signed and exchanged the agreement on behalf of their respective organizations at the Banks premises. Executive Director of Credit and Development Forum (CDF) Md. Abdul Awal was present at the moment. Additional Managing Director of the Bank M. Reazul Karim, Head of International Division and SEVP-Habibur Rahman, SVPs-Hassanul Zahed, Sk. Matiur Rahman, and SAVP-Md. Abdul Quddus, and Sr. Assistant Director & CFO of UDDIPAN Diptimoy Barua were present on the occasion. This arrangement will facilitate the beneficiaries of remote locations of Bangladesh for receiving remittances from 210 outlets of UDDIPAN, sent through the fully owned subsidiaries of Prime Bank in Singapore and UK, Western Union Money Transfer and other 30 exchange companies of different countries having remittance arrangement with Prime Bank Limited. The beneficiaries living in remote locations of Bangladesh will be able to collect remittances sent by their dear ones through network of UDDIPAN all over the country. Introduction of information technology will improve the service standard bringing benefits to the doorsteps of beneficiaries in a secured and efficient manner encouraging remitters to prefer banking channels thereby raising overall inward foreign remittance in Bangladesh. 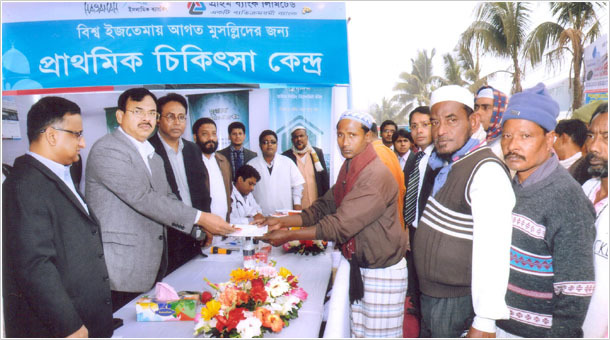 Prime Bank Limited opened a Medical Camp at Ijtema premises for the devotees of Biswa Ijtema that started on 13 January, 2012 as part of its corporate social responsibility. Md. Shirajul Islam Mollah , Chairman of the Board of Directors of the Bank inaugurated the Medical Camp. Isbahul Bar Chowdhury, Deputy Managing Director of the Bank was present at the moment. Medical facilities were provided to the devotees of Biswa Ijtema free of cost from this Medical Camp during Ijtema. With the management of Prime Bank, medicare facilities with medicines were rendered to all, 24 hours a day through professional physician. The Medical Camp was officially opened from Friday morning. It continued till 15th January at the Ijtema premises under direct supervision of Md. 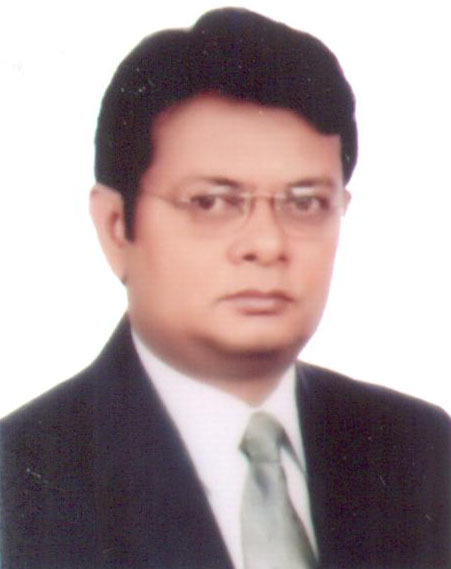 Shahidul Islam, SVP & Head of Islami Banking Branch, Dilkusha Md. Shahin Alam, SVP & Head of Tongi Branch, Abu Zafar Md. Sheikhul Islam, SVP and Mohammad Nuruzzaman, SAVP of Islamic Banking Division of Prime Bank. M. Reazul Karim has been elevated as Additional Managing Director of Prime Bank Limited with effect from January 01, 2012. Prior to his new assignment he had been serving the Bank in the capacity of Deputy Managing Director and Chief Risk Officer. M. Reazul Karim has been serving the Banking Industry for the last 27 years. He started his Banking career in 1984 as Probationary Officer of National Bank Ltd. After joining in Prime Bank Limited in August, 1995, he served the Bank in different capacities including Chief Finance Officer (CFO), Head of Branch of various large Corporate Branches and Head of Credit Division. A Graduate with Honors in Accounting from University of Dhaka, M. Reazul Karim completed his Masters in Accounting from the same institution. He is a fellow member of ICMAB. M. Reazul Karim underwent various training courses and participated in seminars and workshops on different aspects of banking both at home and abroad. Prime Bank Limited opened three ATM booths at Muradpur, O R Nizam Road and Jubilee Road in Chittagong recently. 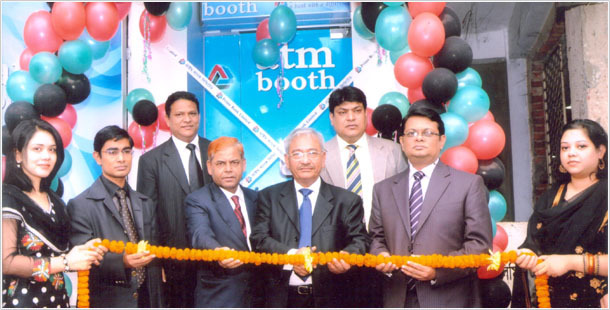 Director of the Bank Mrs. Shahnaz Quashem opened the 79th ATM booth at Muradpur and Former Chairman of the Bank Md. Nader Khan inaugurated the 80th and 81st booths at O R Nizam Road and Jubilee Road respectively. Deputy Managing Director of the Bank M. Reazul Karim, heads of branches of Chittagong Region, local elites and businessmen were also present at the occasion. Inaugurating the booths former Chairman of the Bank Md. Nader Khan said Prime Bank is gradually expanding its technology based banking facilities through ATM, not only in the urban areas but also in the rural areas of the country. Through ATM booth customers can withdraw their money as well as know their accounts status by mini statements, he added. 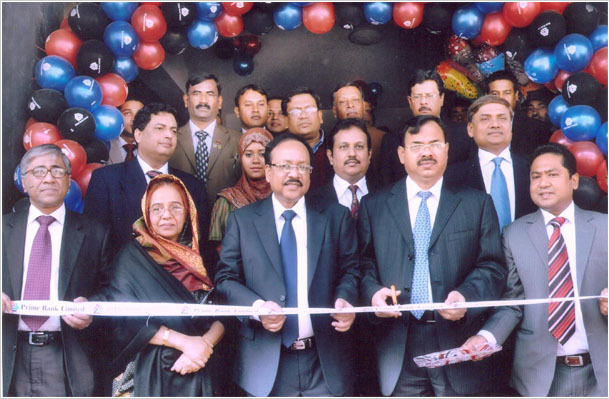 Prime Bank Limited opened its 118th branch at Ibrahimpur, Dhaka on 26 December. Chairman of the Bank Md. Shirajul Islam Mollah inaugurated the branch as the chief guest. Director of the Bank Mrs. Firoza Amin was present at the ceremony as the special guest. Managing Director of the Bank Md. Ehsan Khasru presided over the program. Deputy Managing Director Ahmed Kamal Khan Chowdhury delivered the welcome address. Acting Vice Chancellor of Southeast University Dr. ANM Meshquat Uddin was present at the program as honorable guest. Head of branches of Dhaka Division and high officials of the corporate office were also present on the occasion. Inaugurating the branch, Chairman of the Bank Md. Shirajul Islam Mollah said our customers have brought our Bank in todays leading position as they are well aware of the achievements of the Bank. People of all tiers of the society can avail the products and services of the Bank. He added this branch will play important role to reach the foreign remittances to the beneficiaries in the vicinity. He invited all the businessmen and the elites present at the occasion to take the advantage of the Banks Retail and SME loans and various types of deposit products. Managing Director of the Bank Md. Ehsan Khasru said Prime Bank has achieved significant progress in all areas of business operations in a short span of time because of its competent Board of Directors and efficient Management. He stated that the Prime Banks customer friendly deposit and loan schemes have already generated interest among the public. The Bank is providing the small and medium entrepreneurs collateral-free loans through its SME project. Renowned businessman Taslim Uddin and writer & social worker Rokeya Yusuf along with the local elites and businessmen delivered speeches at the occasion. The Head of Ibrahimpur branch, Nazrul Islam gave the vote of thanks. The program ended with opening of the ATM booth and Milad & Doa Mahfil. Prime Bank central compliance unit of the Internal Control and Compliance Division of head office organized a workshop at the conference hall of Hotel Royal Intl. 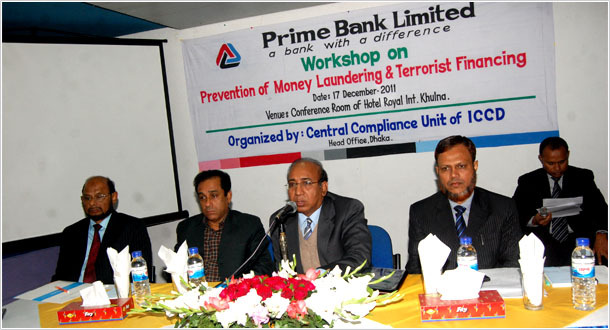 in Khulna titled Prevention of Money Laundering & Terrorist Financing on 17th December. Deputy Managing Director of the Bank Muhammad Yasin Ali inaugurated the workshop as the chief guest. Acting GM of Khulna office of Bangladesh Bank Md. Rabiul Islam was present at the program as the special guest. The workshop was presided over by Head of Khulna branch of the Bank, SVP-Sk. Anisuzzaman. Chief Money Laundering Prevention and Compliance Officer of Prime Bank, VP-Md. Aminul Islam was also present at the occasion. The training workshop was conducted as the resource persons, by Deputy Director Sk. Shahriar Rahman & Asst. Director Dipankar Biswas of Bangladesh Bank Khulna office. A total of 40 officers and executives of Prime Bank branches located in the South region participated at the workshop. The workshop ended with questionnaire and quiz competition. 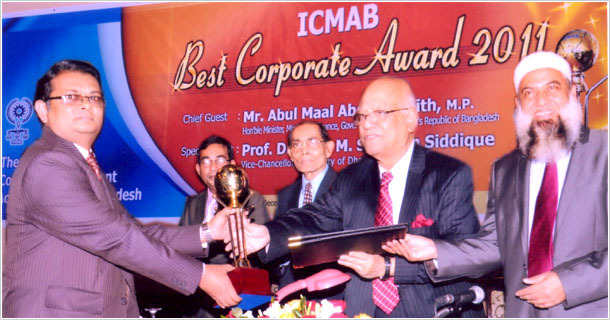 M. Reazul Karim, Managing Director (Current Charge) of Prime Bank Limited received the 1st Prize in the ICMAB Best Corporate Award-2011 in the private banking category from AMA Muhith, the Finance Minister and Chief Guest of the ceremony, on 12th December, at a City Hotel, arranged by the Institute of Cost and Management Accountants of Bangladesh (ICMAB). This award is the testimony of the Transparency, Accountability, Good Corporate Governance and the Overall Stability of the Bank. Prime Bank Limited opened its 117th branch at Ashugonj on 11 December. Chairman of the Bank Md. Shirajul Islam Mollah inaugurated the branch as the chief guest. Deputy Managing Director M Reazul Karim delivered the welcome address. EVP of the Bank Farhad Uddin, President of Ashugonj Chamber of Commerce Golam Hossain Ipty, Chairman of Ashugonj Upazila Haji Md. Anisur Rahman and Director of Bangladesh Fertilizer Association & renowned businessman Abu Naser Ahmed were also present on the occasion. Inaugurating the branch, Chairman of the Bank Md. Shirajul Islam Mollah said actual economic progress of the country is possible through the economic development of the grass-root level of the country. He added this branch will play important role to reach the foreign remittances to the beneficiaries in the vicinity. He illustrated some of the Banks CSR activities through Prime Bank Foundation. 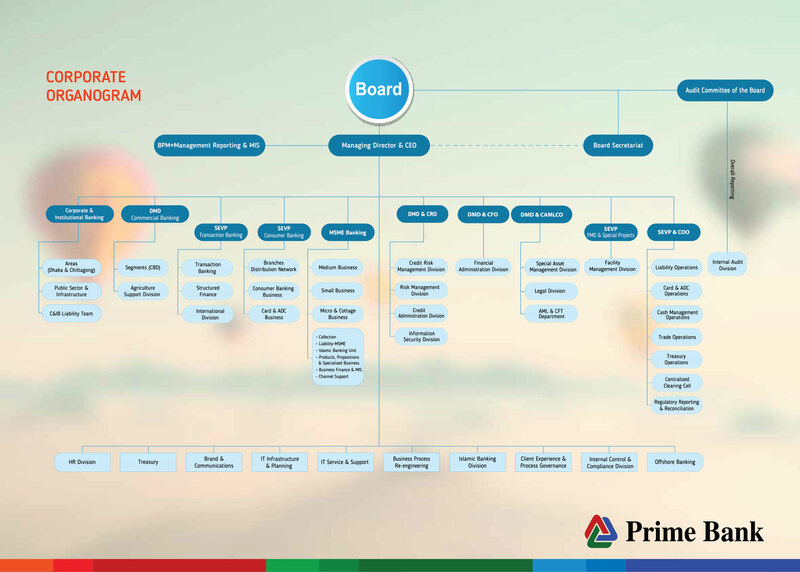 Deputy Managing Director of the Bank M Reazul Karim said Prime Bank has achieved significant progress in all areas of business operations in a short span of time because of its competent Board of Directors and efficient Management. The Bank is providing the small and medium entrepreneurs collateral-free loans through its SME project. He invited all the businessmen and the elites present at the occasion to take the advantage of the Banks Retail and SME loans and various types of deposit products. Ex-Mayor of Ashugonj Pouroshova Advocate Fakrul Alam Akkas, President of Sommilito Sanskritik Bikas Kendra Dr. Abdul Al-Mamun, DGM-Finance of Ashugonj Power Station Co. Ltd. Md. Shahidullah and renowned businessman Mizanur Rahman along with the local elites and businessmen delivered speeches at the occasion. The Head of Ashugonj branch, Md. Arman Uddin Bhuiyan gave the vote of thanks. The program ended with opening of the ATM booth followed Milad & Doa Mahfil. Prime Bank Limited has been awarded SAFA (South Asian Federation of Accountants) Best Bank 2010 on the basis of the evaluation of annual report. Chief Financial Officer of the Bank Ahmed Kamal Khan Chowdhury received the award of Best Bank from Lt. Col. (Rtd.) Muhammad Faruk Khan, Minister for Civil Aviation and Tourism at the Bangabandhu International Conference Center, Dhaka recently. The Best Bank award was adjudged to Prime Bank in recognition to the best presented accounts, strict adherence to regulations and disclosure of corporate governance practices in the Banking Sector of Bangladesh.